We had two dwarf hamsters. We’re contemplating getting a dog, but we’re not quite ready to make the commitment. We don’t really care for fish or hermit crabs, and I do not like cats. But Sophie and I fell in love with Madison when we saw her at our local arts & crafts fair. Madison is the newest addition to our art collection and she’s a clock. 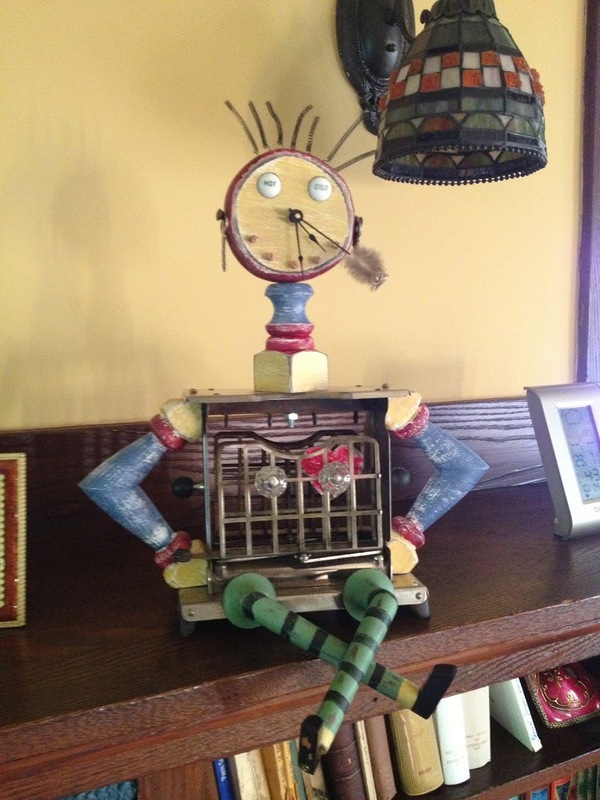 Made by a couple from Ohio who collect antiques (their studio is called The Perfect View), dismantle them and recycle them into sculptures, Madison’s piece de resistance is her belly, which is made from a 1927 toaster. Her beautiful curls also come from the toaster. Her shoes were cobbled from ebony piano keys and her earrings are antique cabinet keys. There’s a feather attached to the second hand because time flies. Welcome to the family, Madison!